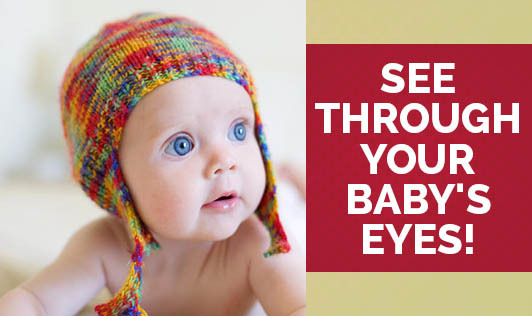 See Through Your Baby's Eyes! Till the first few weeks, the babies are able to see the objects which are in the close vicinity only. Their vision is not stable and often keeps going from side to side. The approximate distance up to which they can see is about 8 to 10 inches from the eyes. This distance is more or less the same as the mum's face at the time of breastfeeding. So, this is time when the baby can actually study and get to know the mum's face better. At about 3 months of age, the baby can shift the gaze to moving objects. By 4 months of age, the baby can differentiate between various colours. In another couple of months, the baby can observe his/her fingers properly, and can turn toward bright light very fast. Till the baby reaches 1 year of age, he/she will be able to estimate the distance between objects and the hands. A 3D vision is developed till this age. The vision almost equals to adults by this age.